The most exciting tech of 2015 isn’t wearable. It’s driveable. 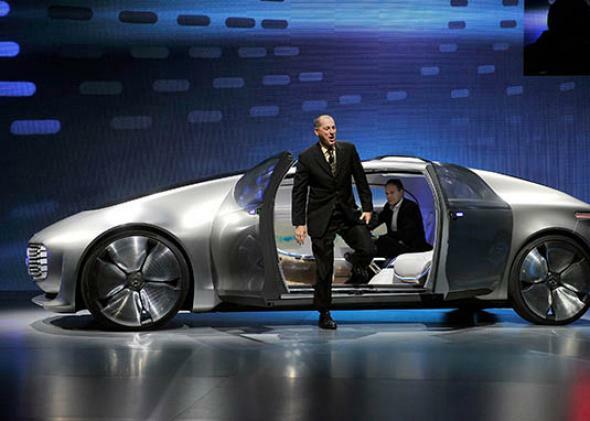 The Mercedes-Benz F 015 was unveiled at this year’s CES. Each year at the largest tech conference in the world, Nvidia hosts a press event to show off its latest chips and graphics processors. In past years at the Consumer Electronics Show in Las Vegas, it touted speedy new chips aimed at smartphones, tablets, and game systems. This year, however, its show revolved around what appears to be the next big mobile computing platform: the car. Other steps on that road abounded at this year’s conference. Among the most interesting, if unheralded, was a new LIDAR system from a two-year-old Silicon Valley startup called Quanergy. The company’s CEO, Louay Eldada, told me its solid-state sensors can provide the data needed for a self-driving car far more cheaply than Google’s Velodyne-powered system. It already has deals with Mercedes-Benz, Hyundai, and Renault–Nissan, a rarity for a startup so young. It’s a signal of just how fast the race to autonomous vehicles is beginning to unfold. The boldest statements came from a pair of German automakers. 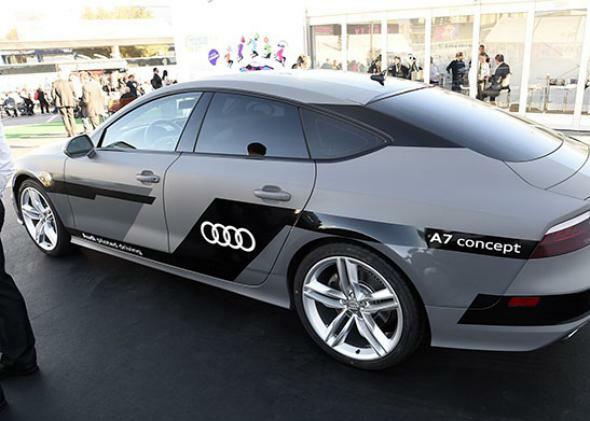 This Audi A7 drove itself to Las Vegas from Palo Alto … for the most part. Audi rolled into Las Vegas with an A7 that had driven itself there from Palo Alto, more than 500 miles away. The car wasn’t fully in charge at all times, notes Wired’s Alex Davies, who sat behind the wheel for part of the trip. Audi’s technology is designed to take over for long stretches of highway, leaving unpredictable local roads and unforeseen circumstances to human expertise. Audi calls it “piloted driving,” and it’s an advanced form of the adaptive cruise-control systems that automakers are already beginning to offer. The company believes the technology will be built into its new cars by 2020, if not before. Further down the road is the radical vision presented by Mercedes. The 89-year-old luxury automaker arrived at CES with a new, wildly futuristic concept car that imagines what vehicles will look like when the computers take over entirely. The vehicle, awkwardly dubbed the F 015 Luxury in Motion, featured a loungelike interior in which four swivel seats can be turned toward each other while the vehicle pilots itself down the road. 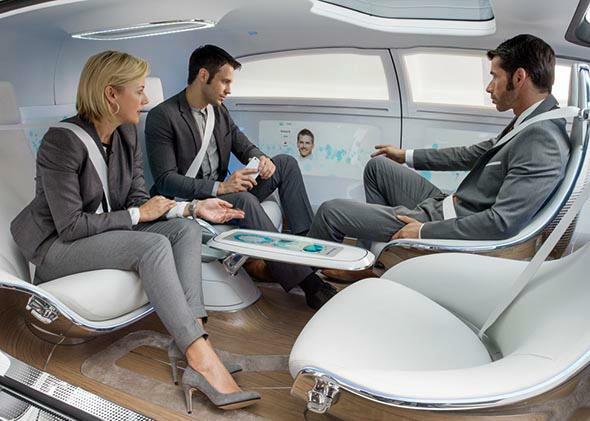 The self-driving Mercedes F 015’s interior. Toyota, meanwhile, countered Tesla’s push toward an electric-car infrastructure with its own ambitious vision for a “hydrogen-powered society.” The hydrogen fuel cell Toyota Mirai, already on sale in Japan and due out in the United States later this year, will require an extensive refueling network of its own. So, following Tesla’s lead, Toyota announced at CES 2015 that it’s opening up thousands of its fuel cell patents in hopes of jump-starting innovation in the sector. Detroit’s big three also made their presence known at the conference, albeit with somewhat less inspiring wares. Chrysler focused on its connected-car apps, which felt a little desultory given what its rivals were up to. But Ford had a keynote speech, with CEO Mark Fields outlining a relatively conservative road map to autonomous vehicles. The company won’t build a self-driving car anytime soon, he said, although he does believe it will happen someday. For now it’s focused on driver-assistance features like self-parking and adaptive cruise control. Fields also announced a “smart mobility plan” comprising 25 separate experiments around the world designed to address the transportation needs of the future. They include a car-sharing program for workers at the company’s Dearborn, Michigan, headquarters and an app that finds open parking spots in London. General Motors, meanwhile, jumped the starting gun on next week’s North American International Auto Show in Detroit by rolling out its next-generation Chevy Volt at a CES press event on Sunday. It offered few details about the car, other than to point out that it is the top-selling plug-in hybrid on the market. Still, it was another signal that CES is becoming a major event on automakers’ annual schedules. To me, that was among the most interesting takeaways from the weeklong convention, whose prestige has eroded in recent years as the biggest technology companies have shied away. In 2011, my former Slate colleague Farhad Manjoo called CES “the most useless week in tech,” bloated with vaporware and bogus trends. The vaporware and bogus trends have not gone away. But the absence of the Apples, Microsofts, and Googles from CES also leaves the stage open for surprising developments from unexpected corners of the tech world. This year, the auto industry seized the spotlight. The automobile is, after all, one of modern society’s most important technologies. But the sector was so bereft of genuine innovation for so long that we no longer think of car companies as part of the technology business. The major automakers are finally being shaken from their stupor, thanks to a big push from auto industry upstarts and outsiders like Google, Tesla, and Uber, who have each jolted the industry in its own way. If CES 2015 is remembered for anything, it could be as the year the car companies woke up. Correction, Jan. 20, 2015: This article originally misidentified Unreal Engine 4 as a video game. It is a suite of software tools for game developers.